Everyday I thank my stars for our time in the Southwest. Had it not been for those years, the joy of Southwestern & Mexican dried chiles with their complex smoky & not necessarily hot flavors would have forever eluded me. In Asia, the presumption is that Chiles are always hot. Because in that part of the world, it is true. It is also true that larger the chile, lesser the bite, but by and large in Asian cooking, chilies are used for their heat. On the other hand, Southwestern & Mexican dried chiles like Guajillo, Anjo, Chipotle & Casabel are used less for their heat but the incredible smoky and rich flavor they impart. And they are absolutely magnificent with all kinds of meat and seafood. My absolute favorite is using Chipotle chiles in shrimp cocktails. Shrimp cocktails are one of my absolute favorite foods in the world and I have been known to chow down even the mayo laden versions with much gusto. 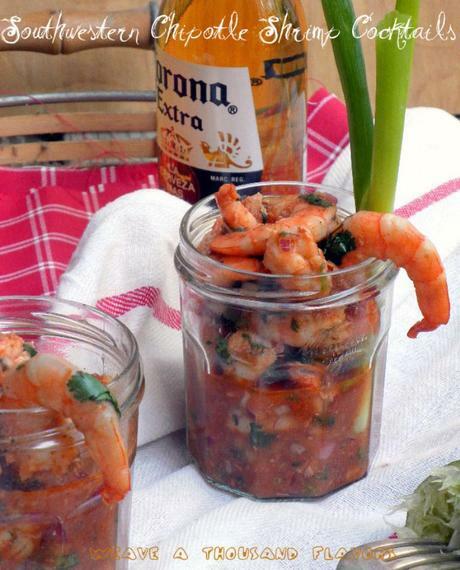 Mexican shrimp cocktails with a tomato juice base is found in marisco or seafood restaurants all over Mexico. Versions that include a heavy dose of hot serrano chiles paired with a liberal dose Tequila is considered quite the cure for a hangover after a night of fun. In this Southwestern inspired version, I've paired the smoky heat from the Chipotle comes with the heat from a serrano chile in a clam-tomato juice loaded with red onions, cilantro and fresh lime juice, not forgetting succulent & plump garlicky shrimp. Whether scooped out of a bowl with tortilla chips in the backyard with swigs of Coronas or Dos Equis or turned into ideal picnic fare when served in small mason jars, carried in a cooler filled with ice for a day in the sand or at the park, one thing is sure: Summer just got a tad more sizzlin'! 1-1/4 cup Clamato (combination of clam juice & tomato juice) OR 1-1/4 cup tomato juice, juice of 2 limes, 1/2 tsp salt, 1/2 tsp Chipotle Chile powder (if you can handle more spice), 1 tsp hot sauce & 1/2 tbs vegetable oil. Garlic cloves: Crush and finely chop. Cilantro: Separate the stalks from the leaves. Finely chop the leaves and set aside. In a sauce pan heat the oil on medium-high heat. Add the garlic and as soon as it begins to sizzle, add the shrimp, cumin powder, chipotle powder & salt. Saute for about 2 minutes, turning the shrimp constantly so it turns color pink on all sides. As soon as the shrimp turn pink, remove from the heat and into a large non-reactive metal or glass mixing bowl. 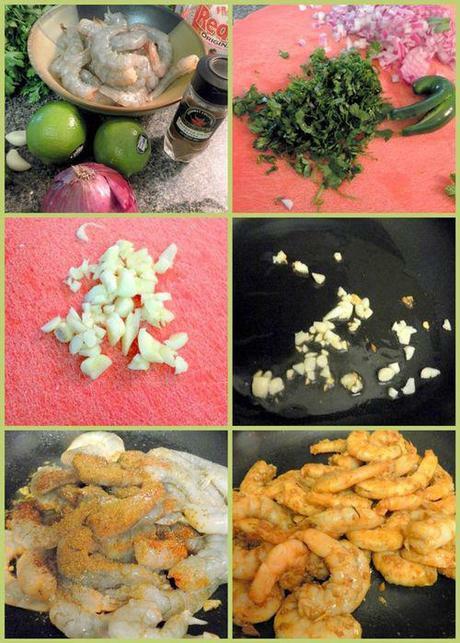 To the sauteed shrimp, add the chopped onions and cilantro and stir to combine. In a small mixing bowl, add the clamato or tomato juice, lime juice, chipotle chile powder, hot sauce & salt. Whisk to combine. Place a plastic wrap over the bowl and chill in the refrigertor for 30 minutes to 45 minutes. Remove to a serving bowl and serve with tortilla chips. In a sauce pan heat the oil on medium-high heat. Add the garlic and as soon as it begins to sizzle, add the shrimp, cumin powder, chipotle powder & salt. Saute for about 2 minutes, turning the shrimp constantly so it turns color pink on all sides. As soon as the shrimp turn pink, remove from the heat and into a large non-reactive metal or glass mixing bowl. 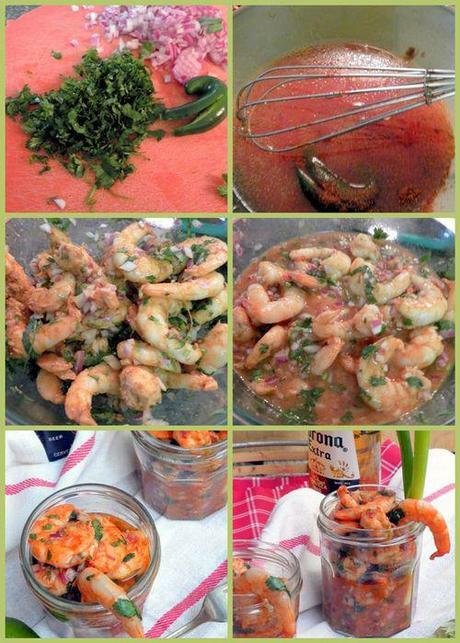 To the shrimp, add the chopped onions and cilantro and stir to combine. Pour the dressing into the shrimp and stir. Place a plastic wrap over the bowl and chill in the refrigertor for about 30-45 minutes until it has chilled. Picnip tip: Remove to small mason jars and carry in a cooler filled with ice and/or ice packs for a picnic. Carry the tortilla chips in a bag to go with along with extra limes if needed.